Companies who choose Mills Manufacturing for highly technical textile manufacturing can count on us to deliver on our promise every time. Centrally located in Asheville, NC, we’re a trustworthy and reliable manufacturer of custom cut and sew products for commercial and industrial businesses, as well as militaries. We pride ourselves on our proven track record and commitment to quality. We make all of our decisions in-house with no big corporation to make choices for us. All staff are based at our Asheville headquarters, so our team of experts is very accessible. Does your business offer customers a textile product with complex designs and strict specifications? Are you searching for a manufacturer who follows strict safety protocols and procedures? Do you value American made? Contact us! We’d love to hear from you! While our expansion into contract cut and sew for non-military entities is recent, we have served the military for more than 75 years. We service all five branches of the US Armed Forces and more than 65 other nations. 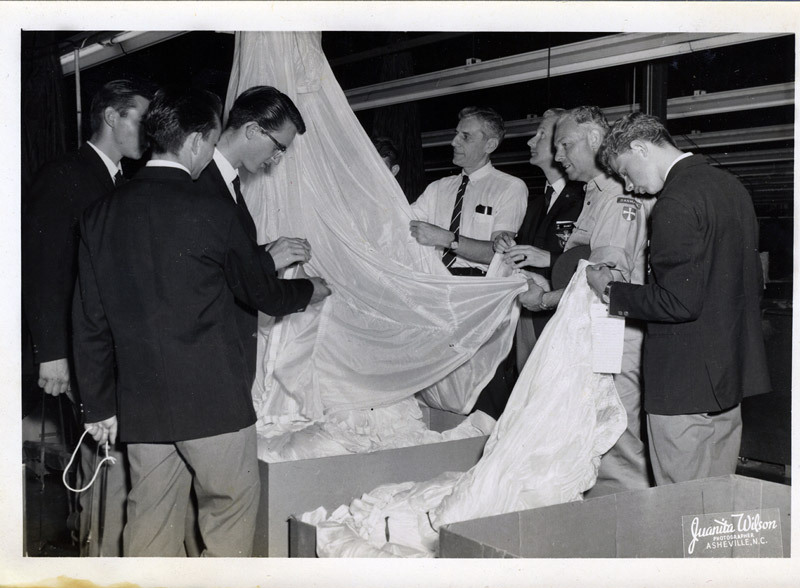 When Ernest Mills opened Mills Manufacturing in 1935 as a women’s undergarment producer, little did he know his business would soon become one of the most trusted sources by the US Department of Defense as a supplier of military parachutes. When we switched from undergarments to cut and sew military items for WWII, we found our calling. For decades, we’ve been a global leader in producing military parachute systems and components. Read more about us.